Meat reduction targets and scenarios – where are they? The following post will not discuss animal rights but meat production and consumption – an issue which is of enormous importance given the billions of suffering and slaughtered animals. Most future scenarios show meat production and consumption on the rise, especially in the developing countries. In developed countries meat consumption is flattening or even decreasing for certain products (e.g. beef), but production for certain kinds of meat (e.g. poultry) can still rise due to increased exports. Meat consumption in developed countries is far above recommended consumption levels: In Germany in average each adult consumes almost an entire pig per year. The problems and the unsustainability of meat production are widely known and part of the political and societal debate (high greenhouse gas emissions, soil and water pollution through nitrogen compounds, land use change, animal suffering and negative health impacts). If climate change and all the other negative effects were taken seriously, it would have a major consequence: Meat production and consumption would need to decrease drastically in the decades to come. But it is striking that there are only very few studies that show target scenarios which reflect the necessary downward curves for meat production and consumption and the impacts and potential benefits. There is also a lack of comprehensive studies on policies that could be applied to get on the path of those reduction scenarios. These numbers only show the necessary production decrease (a reduction of over 3% per year would be required between 2014 and 2050!) to reach the greenhouse gas emission target. Actually, if consumption was according to the guidelines of the German Society for Food (DGE), the production could be even lower (provided that meat would not be produced for exports instead). The lack of studies and meat reduction asssessments means that policy makers are actually “blind” given the few information and data which could guide them towards strategies for a decreasing meat production. The “blindness” may result in negative consequences for local and global ecosystems in the short, mid and long term. 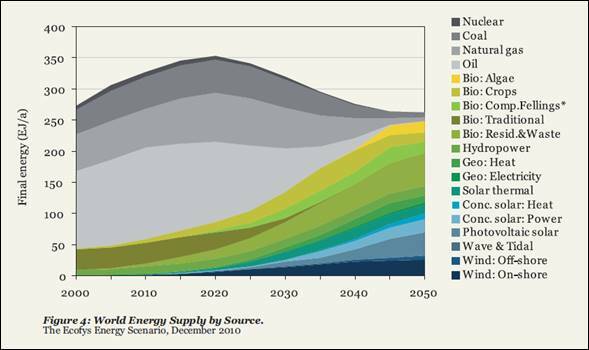 An important point in these scenarios is that fossil energy production (similarly to the meat production) show a downward trend at a given moment. Those scenarios have helped policy makers, industry, researchers and the society that there are alternatives to an ever-growing need for fossil fuels. They are also indispensable to define objectives and trajectories for future energy production. Therefore it is time to develop alternative meat production scenarios using similar methods as they are being applied in energy scenarios and drawing comparable policy conclusions. In this scenario the conventional animal farming can be compared with fossil fuels while organic animal farming would be similar to renewable energies. It is clear that this analogy holds only to a certain extend because animal rights are also not ensured under organic conditions. 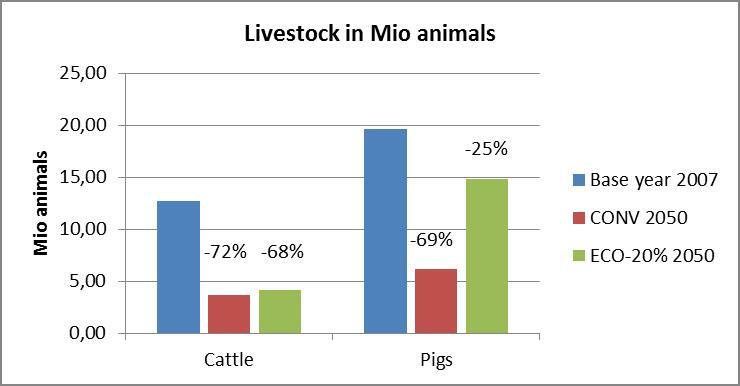 So even if all animals were raised according to organic standards – meat production would still have to be further reduced (or better: abandonded) in the long term. For any alternative scenario and the various policy paths that are imaginable to achieve them, a comprehensive assessment of their impacts on emissions, trade flows, prices, rural structures and economic activities, subsidies, jobs, soil, water, etc. would be needed in order to anticipate to the extent possible future developments. In the next months a German Foundation may take a first step in developing a target scenario and showing impacts of certain policy measures. As I have helped to define the Terms of Reference, I may stay involved in this project. But apart from this initiative, it is crucial that policy makers take on the task to commission studies for meat reduction scenarios, to use the results in order to set binding targets and implement policies to achieve them. We have to get serious about it if we want to end the abuse of domesticated animals. FAO projections foresee an increase in per capita meat demand in developed countries by 24 % between the base year and 2050 (see Grethe “How to feed the world’s growing billions” p. 54). 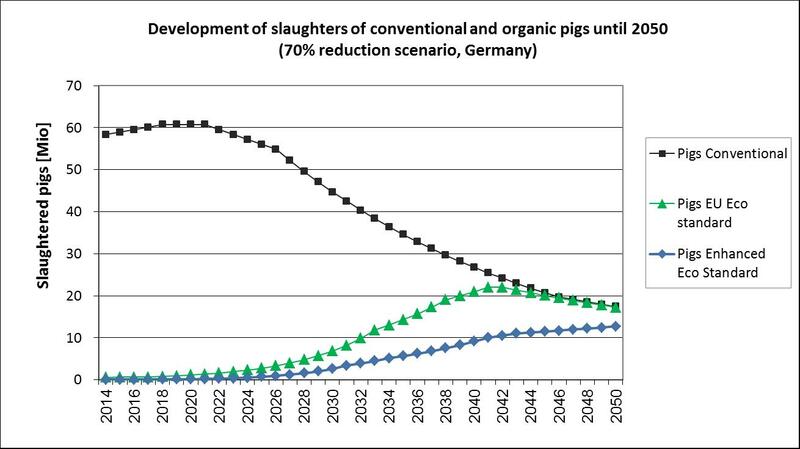 68 Mio of 81 Mio Germans are adults, 58 Mio pigs are slaughtered, results in 0,85 pigs/adult. This does not even include pork meat imports. WWF/Ecofys (2011): The Energy Report – 100% Renewable Energy by 2050, Utrecht. This entry was posted in 3. Target setting, Domesticated Animal Citizenship. Bookmark the permalink.